The bicycle family, that is! Hers- my "daily driver" a Mercury, made by Murray. It's basically a 1990s re-issue of the 1946 Westfield Crescent. And his- a red Sears Spaceliner, c.1960. I never pass up an opportunity to acquire anything vintage bicycle-related! 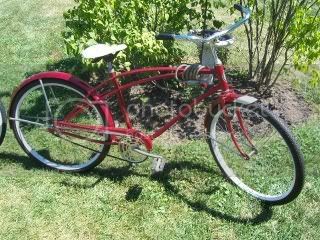 So when my mom got a brand new Trek, I immediately asked if I could have her old bike, a 1960s Schwinn Suburban. My mom put many many miles on this bike. And at age 71 she still thinks nothing of packing up and going 10+ miles on her new bike. This is my first geared bike (it's a 10 speed) since I was in high school. 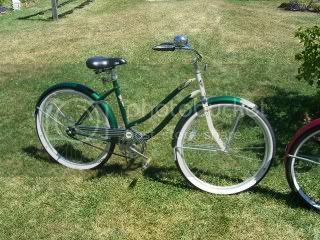 I rode it around in the yard for quite a while yesterday trying to get the feel for shifting gears again. It's a little bit slippery, and I'm not used to the handbrakes either. But it's a nice comfy road bike and I plan to take some longer rides with it. Once I add a basket to the rear rack I might even be able to take it grocery shopping- probably a 10 mile round trip.